This photograph belongs to Ivy Dykstra (nee Hemsley) who has kindly given permission to post it here. The open arched corridors (which are now fully glazed) ran in front of all the (then) classrooms. Gillian Burchell (front centre) is holding the sign which says IIIk, but it’s the same year (1952) as us Boys next door, who were in class 4A. 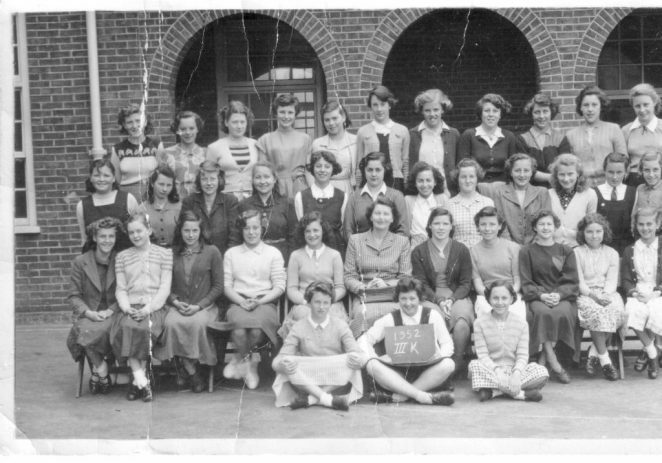 In the second row seated are: Ann Tidy (4th from left) and Gwen Harries (9th from left). Back row: Ivy Hemsley (5th from left) and Jennifer Bell (6th from left). Those are the only names I can recall. Yes – that’s my Mum – Gwen Harries (now Haynes) 9th from left. I will show her this photo when I see her next! Thanks for sharing! The girl standing far right in the centre row is my late elder sister, Jacqueline Wrapson. I wonder, does anyone remember Jackie? I recall she had lots of school friends at that time. On leaving Whitehawk Academy for Young Ladies she went on to drama school and was to become a professional dancer, later on she enjoyed a very successful career treading the boards in amateur dramatics. Sadly Jackie passed away in 2006 aged 66 years. Do you have any photos of late fifties and early sixties? Jeff Haynes, your mum (Gwen) also appears in the VE Day Street Party picture for Rugby Place and also in a Manor Farm Youth Club picture elsewhere. Her brothers Ralph and David (your uncles) are also in the Rugby Place picture. Ralph was a pal throughout our school days at St Mark’s and Whitehawk Seniors. Please remember me to your mum! Does anyone have any info on Whitehawk Boys School? Hi I was at Whitehawk Secondary girls school. between late 1959 and 1963, my name then was Carol Lister. I lived in South Woodingdean and had to travel by bus there and back by climbing down the hill at the front of the school in the morning and back up the hill to get the bus at the end of the day, not good in the winter time. Is there anyone out there who remembers doing the same thing?